There's something mythological about Led Zeppelin. Even beyond the obvious Tolkien references and pseudo-Nordic war songs, the band exists as some sort of rock archetype. Dozens of rock cliches and expectations were created by Led Zeppelin (and perhaps solidified by This is Spinal Tap), including the legendary debauchery, the twenty-minute instrumental solos, the early death of the drummer, and the power ballad. There's a common thread in Western literature, from Hesiod to Sarah Palin, that the reader has just missed the famed Golden Age by a generation or two. This certainly applies to rock music. Turn on any "classic rock station" (it doesn't matter which one, because they're all exactly the same). Not only is there a lot of griping about how music used to be better and the absence of any songs recorded after around 1985, but there's also a lot of Led Zeppelin songs. Much like any myth, the story goes that once upon a time, these rock titans walked the earth. They're gone now, and with their departure the Golden Age of Rock ended. I've listened to enough contemporary bands for this project to know that this isn't true, and there's plenty of good music to be found in 2011. But there's a certain amount of truth in the idea that things aren't the same that they used to be. At the very least, Led Zeppelin represent a large imposing rock'n'roll force, a cultural unifier that doesn't come around very often today. The entire mythology of Led Zeppelin fits right in with the massive stadium tours, the loud and heavy albums, Robert Plant's screams and John Bonham's drum solos. Everything about the band was big, from the actual songs to the concerts to the artistic pretensions, to the point that they've reached the cultural ubiquity that few acts can hope for today. So the shadow of Mount Led Zeppelin still hangs heavy over the valley of rock music. It takes up so much space in my vision (and on those radio stations) that it's easy to start taking it for granted. But for the last two weeks I actually took the time out to climb the mountain and appreciate the view, and it's pretty great. I'm not saying that Led Zeppelin are quite the Rock Gods of Yore that they're made out to be (at least not to me. You, of course, are free to worship as you please). But there is some truth in the fact that they were a massively heavy band from a certain time and place that is now passed. There will be no modern Led Zeppelins, at least not in 2011. There's something sad about that, yes, but also something rather fitting. 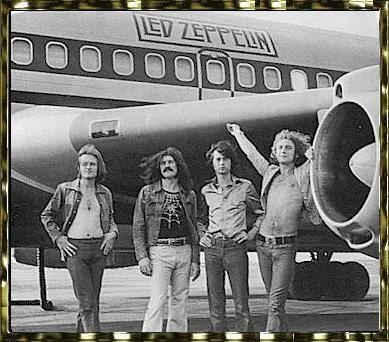 WHAT I KNEW BEFORE: As you might have inferred above, I was familiar with a large number of Led Zeppelin's songs just from modern day radio. Andrew Pankin also introduced me to more of the band's output through party mixes and power hours. MY LISTENING: I listened to Led Zeppelin IV (1971) nearly every day for the past two weeks, taking a break on Christmas and New Year's Day. I also listened to Led Zeppelin (1969) three times, Led Zeppelin II (1969) four times, Led Zeppelin III (1970) three times, Houses of the Holy (1973) twice and Physical Graffiti (1975) twice. Finally, I listened to the massive triple live album How the West Was Won (2005) once through. WHAT I LIKED: A lot has been written about Robert Plant's voice, Jimmy Page's epic guitar riffs, and John Bonham's drumming. But what's impressive is not just that Led Zeppelin is filled with good performers, but that the band works so good as a unit. Listening to the live performances cements this image even further - the members of the band could not only play well, but played well together. Led Zeppelin came out of the gate pretty much fully formed with their first album, and deviated very little from this unified vision, all of their parts feeding equally into the whole. I think about the other Titans of the Classic Rock Era - the Beatles, the Rolling Stones, Pink Floyd - who all continued to evolve throughout their careers, and all reached a certain point where the later albums clearly consisted to two egos fighting over the creative vision. There's no such interior tensions in Led Zeppelin (at least not readily apparent to me). You might say that the song remains the same through the six albums I listened to, and it's impressive that the band meshed so well musically, and managed to sustain this vision for so long. Bands like the Beatles achieved their greatest success through somehow combining these artistic contradictions, but Led Zeppelin's success comes from the monolithic unified front that the band presents. Also, for a band infamous for their excess, Led Zeppelin's albums contain surprisingly little gristle, and a whole lot of fat to chew on. Led Zeppelin II and Led Zeppelin IV almost function like Greatest Hits albums in miniature, both containing at least four songs that are regularly on Clear Channel's classic rock rotation. "Heartbreaker" is a good enough riff to not only sustain the entire song, but sustain it through the years I've been hearing it - it still sounds as exciting as ever. And I suppose the secret is out now that "When the Levee Breaks" is the true tour-de-force on Led Zeppelin IV, but damn if its power didn't surprise me every time - at the end of one of the most powerful albums in the band's repertoire, no less. But if II and IV were filled with all the hits I recognized, I and III were pleasant surprises, chock full of a lot of great songs that don't have the omnipresence of Led Zeppelin's most popular tracks. "Communication Breakdown" is more raucous than many songs in the band's catalog, which makes it all the more fun, and I've had the apocalyptic riff that follows the chorus on "Babe I'm Gonna Leave You" stuck in my head for about a week now. And though III seems to have garnered the reputation as the "soft" acoustic album, any album that begins with "Immigrant Song" and contains the demented stomp "Gallows Pole" as a "soft" song only goes to show that Led Zeppelin do acoustic heavier than most bands do their heavy stuff. There's very little for me to complain about this week. Even most critics' one hesitation - the band's penchant for including fantasy elements - isn't a hang-up for me. I complained a few weeks ago about Black Sabbath's pseudo-mysticism, but Led Zeppelin somehow manages to make it less campy, and they have the sort of image already that makes the Tolkien references not all that surprising. Black Sabbath seemed to adopt the supernatural effects for added effect, but with Led Zeppelin it seems like the mystical fantasy stuff is inseparable from the rest. Also, I still regularly read books about wizards and dragons, so I have no problem with "The Battle of Evermore" or "Ramble On." Still, it would be cheating for me to leave this section blank, so a few minor complaints. First of all, "Misty Mountain Hop" is certainly the weakest song on Led Zeppelin IV, and possibly the weakest on the band's first four albums. I suppose in the days of vinyl there was a side change between "Stairway to Heaven" and "Misty Mountain Hop," but on my iPod it was embarrassing for this goofy, repetitive, annoying drug romp to come after the band's most iconic track. Also, for whatever reason, the band's later two albums, Houses of the Holy and Physical Graffiti, never clicked for me the way that the earlier albums did. It might be because there's only so much Led Zeppelin one can consume even in two weeks without succumbing to exhaustion. But the albums don't seem to flow as me as well as the early ones, and though they have their share of enjoyable tracks, they never were the experience of the Led Zeppelins I-IV were to me. I also think that "D'yer Mak'er" is pretty annoying, and a stupid name to boot. I don't quite feel the same way about "Kashmir." But if tracks like "Stairway to Heaven" and "Dazed and Confused" are transcendent experiences, I still check my watch halfway through "Kashmir." It's all right, but I don't understand it's place in the Led Zeppelin canon as one of the band's best songs. FURTHER EXPLORATION WOULD ENTAIL: Most critics and fans seem to check out when it comes to Presence (1976), In Through The Out Door (1979), and Coda (1982). Let me know if there's anything essential that I'm missing on these albums, because I don't feel immediately inclined to listen to them. I have heard John Paul Jones bass it up on Them Crooked Vultures (2009), and apparently Robert Plant's Raising Sand with bluegrass heroine Alison Krauss is worth checking out. And, of course, there's plenty of live albums and bootlegs to tackle. BEST SONG YOU'VE HEARD: "Stairway to Heaven"
The obvious pick, but really my only option. Much like "Freebird," the epic backlash against this song's cultural ubiquity only cements its reputation as a song to be reckoned with, one way or another. You may like it or hate it, but one thing's for sure - people will still be listening to this song long after your favorite band has been forgotten. BEST SONG YOU HAVEN'T HEARD: "Thank You"
A humble, acoustic offering in the middle of Led Zeppelin II, one of the band's heaviest. It's easy to overlook, but certainly a gem once you find it.